Listed below are sample textbooks, lesson plans and discussion guides developed by Charles C. Haynes and various educational partners. Please order or download these resources by clicking on the links below. Visit the Books & Resources page for additional materials. 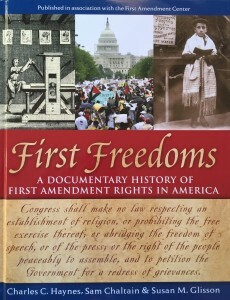 Charles C. Haynes, Sam Chaltain and Susan M. Glisson (2006) First Freedoms: A Documentary History of First Amendment Rights in America. Oxford University Press and the First Amendment Center. Download lessons on religious liberty from the acclaimed curriculum, Living with Our Deepest Differences: Religious Liberty in a Pluralistic Society. The New Edition Revised was coedited by Shaun McFall and Charles C. Haynes and originally coauthored by Michael D. Cassity, Os Guinness, Charles C. Haynes, John Seel, Timothy L. Smith, and Oliver S. Thomas. Both editions were published by the First Amendment Center, the forerunner to the Religious Freedom Center. Provides the historical background and pedagogical strategies for teaching about religion and religious texts in public schools. Provides the historical background for the Virginia Declaration of Rights and its influence on the First Amendment to the U.S. Constitution. Provides the source text for George Mason’s Virginia Declaration of Rights; Thomas Jefferson’s Bill for Establishing of Religious Freedom; and James Madison’s Memorial and Remonstrance. Surveys six big ideas/themes of religious liberty with highlights from Alexis de Tocqueville’s Democracy in America. Explores the historical influence of leaders such as William Lloyd Garrison, Charles G. Finney, and Jacob Henry. Provide immigration charts and various vignettes of anti-immigrant sentiment and its impact on religious minorities. Helps students think through and explain how the First Amendment protects freedom of conscience for people of all faiths or none. Outlines the 20th century death toll and the role of contributing factors such as totalitarianism and the consequences of citizens becoming indifferent to violations of human rights. Exposes students to several key U.S. Supreme Court decisions on and two main schools of interpretation of the religious liberty clauses of the First Amendment. Lesson 10: Tribespeople, Idiots or Citizens? Prepares students to think through and explain how religious liberty entails not only a universal right but also a universal responsibility to respect the right for others, which helps each generation live with its deepest differences. Visit newseumed.org for primary sources, interactive tools and lesson plans about the five freedoms of the First Amendment.